How do builders create a culture that permeates an entire organization? They could read any number of business management books and blogs about that challenge and try digesting jargon that can be as meaningless as an Enron mission statement. Or they could do what Mark Boyce and Dan Horner did: Before launching their company in 2007, the co-founders of True Homes spent a year developing not merely a business plan but an integrated methodology for running their company. “We had both observed in our careers that a lot of builders take a little piece of an idea here and another piece there and add it all to a recipe that, quite frankly, doesn’t work,” Boyce says. The CP Morgan Communities veterans put on paper the business practices, processes, position guides, and character traits they wanted reflected by employees and called it the Red Pill Partner Franchise. The name was inspired by a scene in the film The Matrix, where Neo, the main protagonist, is offered a choice between swallowing a red pill or a blue pill. Take the blue pill, and the story ends, you wake up in your bed and believe whatever you want to believe. Take the red one … and you stay in Wonderland and discover how deep the rabbit hole goes. The founders wanted their yet-to-be hired employees to not merely exist and be consumers of their company culture but to be active contributors—and their managers to be catalysts and executives to be champions of that culture. Still, how does anyone map out a “values-based culture” on paper and apply it to the real world? Perhaps what enabled the 2019 NHQ Gold Award winner to do so is that True embraced, as its foundation, that all people have dignity. They are created in the image of God, with unique gifts that can be brought to a team setting. That may sound highfalutin and seem to have religious overtones, but Boyce and Horner, both Christians, would be among the first to say they don’t regard their company as a Christian organization as such. You won’t find scripture verses posted around the office in Monroe, N.C., and no corporation, they explain, can collectively come into a personal relationship with Jesus. But shouldn’t people working for an organization founded by leaders who follow the values of Christ somehow benefit, whether or not they embrace the faith of their employers? 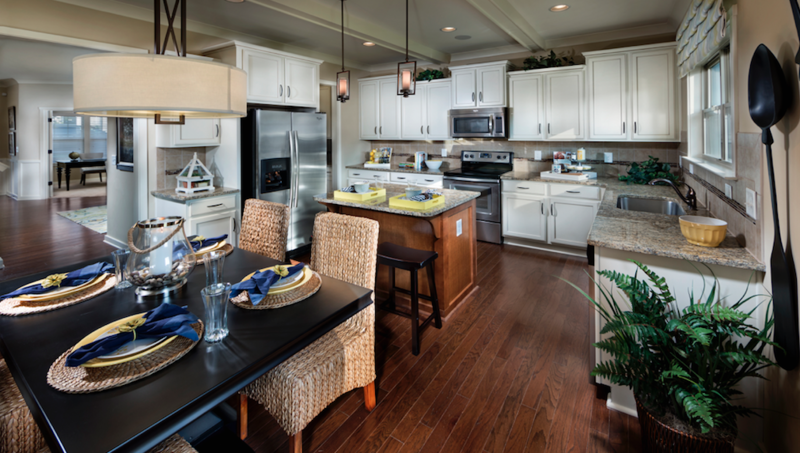 The Drake, one of 19 plans from True Home’s Traditions Collection, starts at 3,292 square feet. Last year, the Charlotte Observer named True Homes one of its Top Workplaces for 2017, out of 6,000 companies. The culture that encourages employee development, feedback, collaboration, and offers rewards through bonuses, recognition, and other perks earned True Homes a score of 98 percent satisfaction in its annual survey of 270 employees. Even the visiting NHQ judging panel noted that the company has one of the best cultures with employees and subcontractors that they’ve ever seen—quite a compliment from fellow builders and quality management gurus who have, between them, worked at, judged, and/or consulted for hundreds of home builders. “It’s a combination of bringing the uniqueness of every individual around a shared common vision, values, and mission, with a definition of the game plan we want to execute,” Horner says. “When those all come together, that’s where the magic happens.” That mission is to be uniquely exceptional in how True Homes relates to clients, associates, and trade partners. 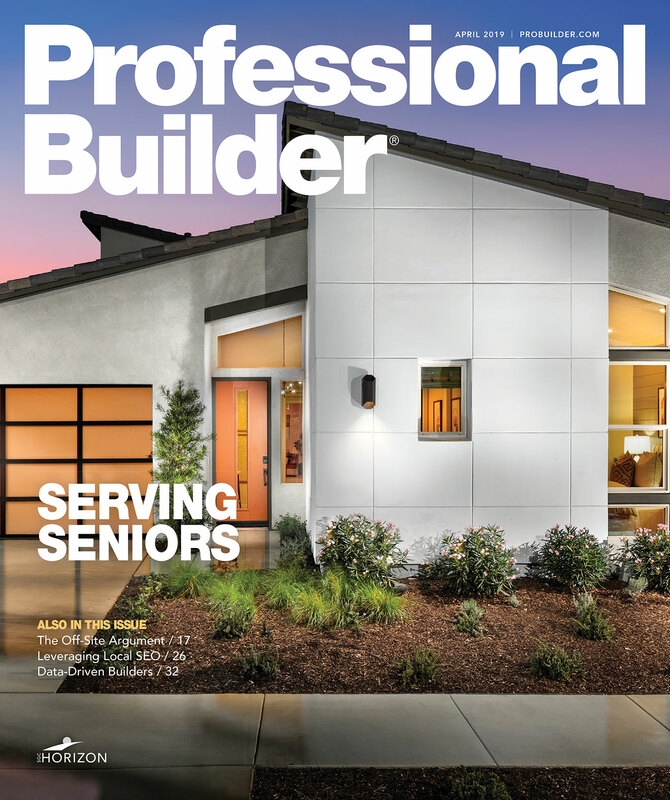 Customer satisfaction scores for sales, design studio, and personal builder departments, as measured by consultants Woodland O’Brien and Scott, are in the top-performer levels for the majority of True’s eight branches active in five North Carolina metros. The builder started in Charlotte during the onset of the Great Recession. It began expanding and diversifying in 2012, grow ing from 620 closings and $117 million in annual revenue to 1,600 units and $420 million projected for 2018. The company’s five product collections cater to first-time, move-up, infill single-family buyers and include an age-targeted lifestyle brand. True Homes entered into rental housing last year and is poised to penetrate the affordable housing market with homes priced under $260,000, a price point that competitors have largely avoided. As the staff grew, Boyce and Horner recognized they needed a way to onboard new employees. They followed an organizational development consultant’s advice to document desired characteristics, competencies, and character traits for associates and managers. The duo applied their worldview to home building by writing profiles for associates and managers using behavior-based definitions. For example, “synergy”—that often ill-defined, overused buzzword—is defined in the associate profile as: effective collaboration that avoids investing energy in actions, attitudes, or words that diminish relationships or create distractions within the organization. “Flexibility,” as defined in the leader profile, is the willingness to change plans or ideas without getting upset. Another facet of Boyce and Horner’s methodology is the three layers of organization they call their “synergistic structure”: the executive services team, centralized services, and the eight market teams. Each group has defined roles and collectively provides specific services for the rest of the company. Executive services wears the owner and investor hats and provides corporate strategy, market research, and access to capital and land. Centralized services delivers support services to the eight market teams, which develop their own annual plans, budgets, and tactical adjustments for tasks such as land delivery, selling, selecting, sourcing, and building. True Homes is on track to build 1,800 homes next year, and it hasn’t been hamstrung by labor availability since coming out of the downturn. As they promoted managers from within, the founders realized they needed to provide leadership training. The True North Leadership platform (TNL) was created in-house to address the approach, actions, and acumen the builder was looking to its leaders to demonstrate, and it became another component of True’s methodology. The platform defines leadership behaviors for people development, stakeholder relationships, client focus, and 12 other categories. Managers are rated each quarter on how well they meet those standards and develop annual plans for improving their leadership skills. The TNL program specifically describes expressions of leadership that are “right track,” that is, in line with the company’s culture, or “side track,” meaning out of bounds. For example, a right-track behavior regarding operations excellence would be a leader who works with a team to address any issues that surface affecting client and associate satisfaction. A side-track behavior would be focusing on issues beyond the leader’s responsibilities and complaining about other things that need to be fixed before his or her department can meet its goals. One of the more obvious examples of True Homes’ focus on the people side of its business is its relationship with subcontractors. Home builders across the country complain about the scarcity and rising cost of skilled labor, but True Homes—on track to build 1,800 homes next year—hasn’t been hamstrung by labor availability since coming out of the downturn, when it closed 400 units. One reason the builder won over its trades is that True gives them year-round volume. Second, the builder has a mutual accountability and respect pact outlining what it will do to provide the best work environment for its subs. Third, and trickier, is that the builder aligns trades with its value-based culture, so they’re both on the same team. The solid relationship with trades started with True applying a manufacturing perspective to home building, treating the construction site as if it was the plant floor. In a factory, the supervisor knows every worker on the floor and makes sure each one has an assignment and the skills to do their job. On a construction site, the project manager doesn’t know all of the subcontractor employees on the job, much less whether or not they’re aligned with the builder’s quality standards. So True Homes embeds a supply chain partner (SCP)—a job title similar to purchasing manager—at the “plant” with the field team manager. Both act as plant managers at construction sites, but they don’t just focus on schedule and transactional cost considerations for securing labor. They actually train subs and their crews to align with the builder’s quality standards, after which the workers are certified as True Crews. The managers also engage in relationship-building by soliciting feedback and regular reviews to discuss capacity, competency, and cost concerns. Subcontractors pledge to consistently send True Crews and to provide better pricing for True Homes jobs. In return, the builder offers year-round volume, mutual respect, and the conditions that enable subs to be efficient and make a profit. For subs with turnover and new faces showing up at jobs, the managers will train and certify the crew leader, who is then accountable for ensuring that crew members are congruent with True Homes’ standards. “We believe that as you create the consistency of those crews operating within our defined standards, their ability to execute to those standards goes up,” Horner says. Another tremendous opportunity in True Homes’ trade relations is TED. The company uses 20 different enterprise technology platforms across the company and TED (Trade Efficiency Dashboard) is a proprietary online dashboard launched in January that gives subcontractors access to daily schedules, variance notices, job readiness, and other reports. Every trade was given specific data showing what portion of that $12 million was based on their documented performance. That information is generating momentum because, for the first time, subcontractors are seeing exactly how much wasted trips and labor are affecting their bottom line. By using the data to self-identify opportunities for eliminating waste, trades are reducing their cost and, consequently, the pricing they offer True Homes. They are better able to look ahead at their workload and allocate more capacity to new projects rather than making multiple trips to jobs they’re not getting paid for. Boyce and Horner contend that it’s that detail of information driven by proprietary technology, more so than delving into modular construction or incorporating more roof and floor trusses into framing, that will drive out labor waste and enable True Homes to build even more affordable homes for first-time buyers in markets where the inventory of houses priced $260,000 or less is just two months supply. “The trades are coming in and embracing TED,” Boyce says. “And we see being able to stay within price points for affordable homes that are supply constrained as the most important operational strategic initiative right now because clients can’t afford to continue to pay us for waste. This is probably the most significant way we’re addressing it,” says Boyce. 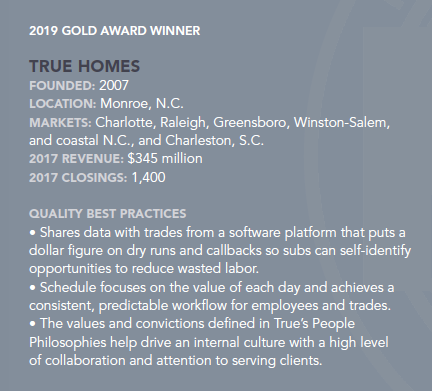 True Homes executives have had contact with the NHQ process having worked at or being part of a Builder 20 club with companies that were Gold winners. That exposure helped shape the founders leaning toward disciplined thinking and action and the importance of having a documented business methodology. “It’s a nice validation that the judges came in and said we’re a Gold level performer. I think what Mark and I are surprised about is when we shared that news with associate after associate and leader after leader, they said this is amazing, but we still have so much we are going to get better at,” Horner says.